Pick of the Week: 20% Off Occupational Octaves Series! 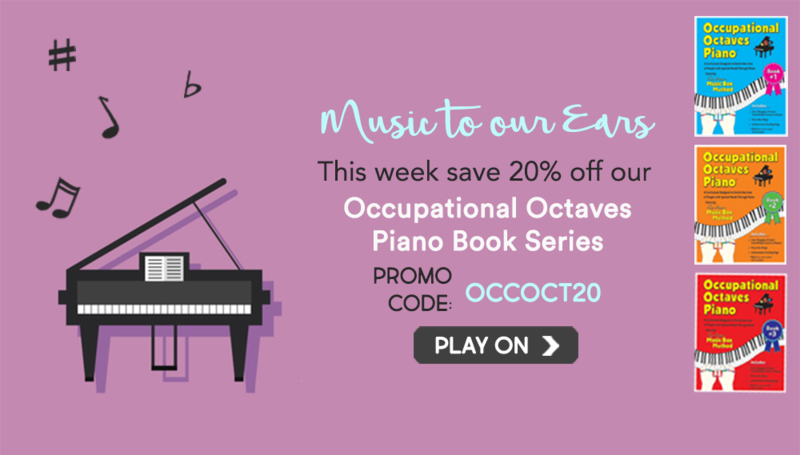 This week only, save 20% off our Occupational Octaves Piano book Series with promo code “OCCOCT20”! Occupational Octaves Piano is the first of its kind curriculum written in the special-needs-user-friendly language of music. Named Lee Stockner’s Music Box Method, this unique piano program has been enriching the lives of students with Autism through music since 2009. ! The original language of music can be a confusing symbolic language that should perfectly instruct a student as to which notes, fingers and beats to play. Occupational Octaves Piano students read the same instructions, not through the traditional presentation of confusing musical symbols, but through colored letters in rhythmically designed boxes. This means that students on the autism spectrum, including those with severe disabilities, can play the same songs as a traditional player with the same notes, fingers and beats as a mainstream student would. Each curriculum music book comes with a set of rings that are placed on the player’s fingers to help them match their hands to the notes they’re seeing. Written by: Different Roads to Learning on November 8, 2016.